Walt Whitman left school at eleven and worked at a variety of trades — he was a printer, a teacher, a newspaper writer and editor, a stationer, and a real estate speculator. One never would have guessed he was destined to become America’s seer. In his early thirties, he began to have experiences that transformed him. In 1855, when he was 36, he published his collection of poems Leaves of Grass. The poems seemed so radical in form and content that he became a revolutionary figure in American literature. In fact, he was initially acclaimed more as a prophet of democracy and of the “common man” in the Western world than as a poet. His aim, he states in the book’s preface, is to “wellnigh express the inexpressible.” “I celebrate myself,” he sings at the beginning of “Song of Myself” — but, as quickly becomes clear, the self he celebrates is not the ordinary self we usually experience. It is far more expanded. There is, in sanest hours, a consciousness, a thought that rises, independent, lifted out from all else, calm, like the stars, shining eternal. This is the thought of identity — yours for you, whoever you are, as mine for me. Miracle of miracles, beyond statement, most spiritual and vaguest of earth’s dreams, yet hardest basic fact, and only entrance to all facts. In such devout hours, in the midst of the significant wonders of heaven and earth, (significant only because of the Me in the centre), creeds, conventions, fall away and become of no account before this simple idea. Under the luminousness of real vision, it alone takes possession, takes value. Like the shadowy dwarf in the fable, once liberated and look’d upon, it expands over the whole earth, and spreads to the roof of heaven. What exactly is Whitman talking about? 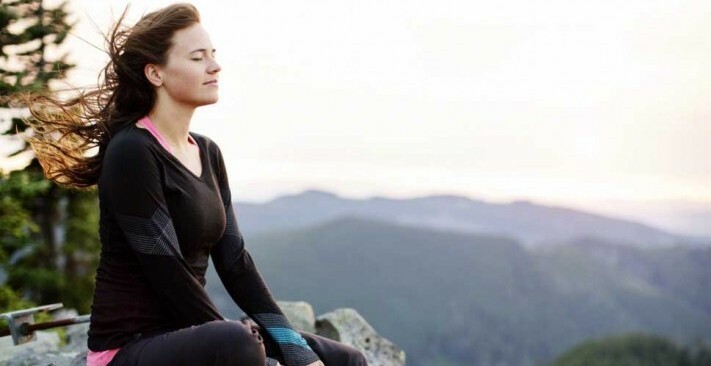 He is describing the experience of the fourth state of consciousness, beyond the familiar states of waking, dreaming, and sleeping — the state Maharishi calls Transcendental Consciousness. In this state, the mind has settled inward. Moving beyond all perceptions, thoughts, and feelings, one experiences consciousness by itself, consciousness knowing itself alone — pure consciousness, unbounded and fully awake within itself. This, Maharishi explains, is the true Self. The central, inner reality of life, Maharishi observes, is pure consciousness, the Self. Throughout this passage, Whitman seeks to convey precisely this knowledge — and the fact that one can experience it directly. (O pensive soul of me — O thirst unsatisfied — waitest not there? These beautiful words hardly need a comment. Whitman speaks directly to the transcendent, the source and center of universes, the center of truth, goodness, and love — and declares at the end that everything he does, everything he is, depends on his ability to transcend, to move “out of myself” to that superior state. Whitman’s transcendental experiences enabled him to produce some of America’s greatest poetry, expressing a vision of the inner glory of life and the invitation for everyone to join him there. Walt Whitman, “Democratic Vistas,” Walt Whitman: Complete Poetry and Collected Prose, ed. Justin Kaplan (New York: J.S. Redfield, 1871), 41. 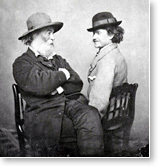 “Democratic Vistas,” in Walt Whitman, 47. Walt Whitman, Leaves of Grass (Philadelphia: David McKay, 1891), 315. First – Probably 1854. Daguerreotype. Photographer unknown: probably Gabriel Harrison. Saunders #5. Courtesy of the Bayley Collection, Ohio Wesleyan University. 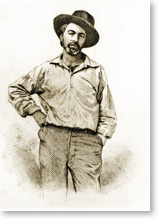 Second – Steel engraving of Walt Whitman. Published in 1855 edition of Leaves of Grass. Source: Bayley Collection, Ohio Wesleyan. Third – Photographer: Matthew Brady, ca. 1860 – ca. 1865.